Windows Security (was Defender) is installed, but OneDrive is not installed within my OS Windows 10 Home (x64) Version 1809 (build 17763.348). I copy all of my HDD content to an external HDD device as part of my computer’s disaster recovery and thereby inhibit Microsoft harvesting my personal information. 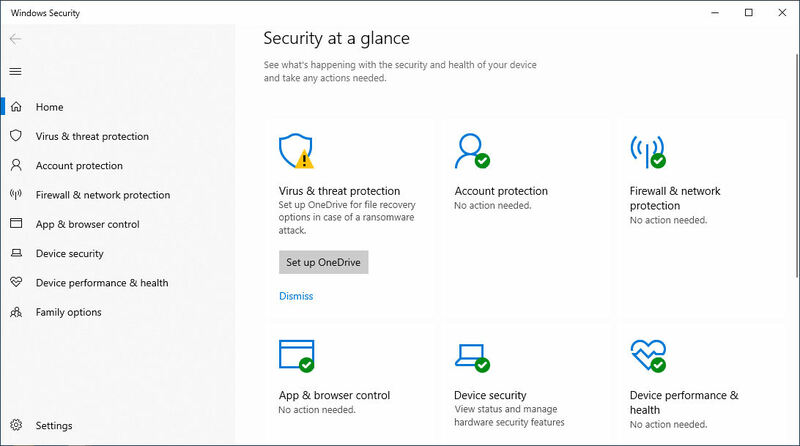 Within Security at a Glance, the Virus & Threat Protection icon is accompanied with a warning nag to Set up OneDrive. Although I keep clicking on the option to dismiss this unwanted nag, it reappears. Does anyone know how the disable this annoying nag for those of us that do not use the OneDrive product? However, I recommend that you google for similar links using search criteria such as "How to disable onedrive Windows 10" and limit the search to the last year or so. You need the configuration process to be current with respect to your version of Windows 10. Read the links and look at your system to ensure that the screens and options available do match with respect to any given setup. Avoid any third party apps claiming to "fix the problem" and likewise any links involving Registry changes. Look first, go step by step, keep notes in case you need to undo some setting or action. As always, with respect to data, ensure that you have multiple backups that have been verified as recoverable. Hi Ralston18, thank you for your response. Unfortunately, the hyperlink does not help because Control Panel > Programs and Features confirms OneDrive is not installed on my computer. My continued internet search came across OneDrive for Business and its assertion that when my Microsoft Office Professional Plus 2013 (x64) was installed, it may also have included the option to Set up OneDrive (for Business). However, going to Start Menu > Microsoft Office 2013, the list of programs has recently responded to the March 2019 Microsoft update to include OneDrive for Business, but this bloatware has never been set up within my cloud settings. I do not know how Windows Security responds to my computer's software profile and I do not want to Set up OneDrive or Set up OneDrive for Business! Has anyone worked out how to disable the Windows Security's annoying Set up OneDrive nag? Question Is it possible to disable the shutdown screen on Windows 10? HPET disabled or enabled on a Ryzen 5 1600x PC with Windows 10?